1. 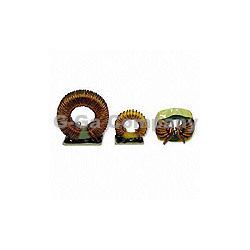 Toroidal filter inductor coils for excellent EMI suppressor, available in various types. 2. Toroidal common mode choke coils. 3. Small-profile common mode choke coils. 4. Ferrite core toroid common mode choke coils. 5. Large-current common mode choke coils. 6. Low-resistance common mode choke coils. 7. MPP, high-flux, sendust, RF carbonyl and iron power core choke coils. 8. For excellent EMI suppressor. 9. High frequency and low loss common mode coils. 10. Common mode filter common mode coils. 11. Toroidal inductor common mode coils. 1. Custom made choke coil with wide frequency range. 2. Key specifications/special features: (1) OEM choke coil. (2) Small, medium and high quantity available. (3) Wide frequency range. 3. Please send the following information via e-mail for quote: (1) Specifications including bobbin, core, dimensional and winding drawing. (2) Additional requirements. (3) Estimated order quantity.